Sometimes it might seem daunting to make a stand about something you care about, especially in front of adults. But 6-year-old Emily was determined to make a point about climate change. She went along to a local council meeting in Cumbria where she asked the people in charge of her local area what they're going to do about it - and they listened! We have 12 years left to stop making greenhouse gases if we want to stop climate change. If you don't act now, in 12 years time, when I turn 18, when I am old enough to be a councillor like you, it will be too late. I will not get my chance to change things. Emily said: "I want to be a councillor like you because then I could make the most important decision ever. The decision that Carlisle will do its bit to stop climate change. I feel like politicians are stealing my future from me by doing nothing. "My future depends on the decisions you make in this room. Please give me a chance to change the world too." After hearing from Emily, Carlisle City Council held a debate about climate change and said it is working hard to cut carbon emissions and improve air quality. They said they will set up a group whose aim will be to help the area's emissions to zero by the year 2030. Emily isn't the only young person who feels strongly about climate change. Protests have been held in the UK and across Europe with children and teenagers choosing to skip school for them. 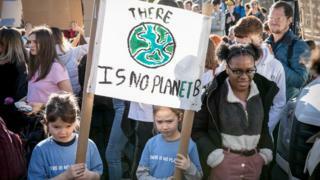 The marches have been inspired by a Swedish teenager called Greta Thunberg. She is So inspiring. I totally agree with her. Let's save our planet.